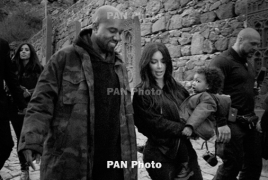 PanARMENIAN.Net - American reality TV star Kim Kardashian has officially confirmed that she and her husband Kanye West are expecting their fourth child together via surrogate. She also verified that it's a boy. Kim, Kourtney Kardashian and Khloe Kardashian joined Andy Cohen on Watch What Happens Live and he dove right in when it came to asking her about her family. "We are," Kardashian, who has Armenian roots, confirmed. Cohen said, "Obviously I knew that, I didn't think you were telling everyone." "I got drunk at our Christmas Eve party and I told some people. I can't remember who I told because I never get drunk," she explained.